The true story of a hospital Corpsman. 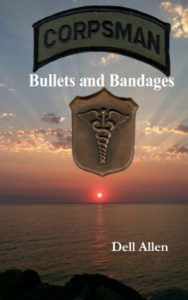 Dell Allen served as a Hospital Corpsman with Alpha Company, First Battalion, 7th Marine regiment, 1st Marine Division, during the Viet Nam Conflict. His well-told first-hand account and accompanying photographs take the reader right into the day-to-day action of the time. If you like non-fiction, history, or war stories, you’ll love this book. This entry was posted in Non-fiction Books. Bookmark the permalink.